Bogotá, Colombia. Photo by Dario Hidalgo. In order to improve road safety, decision makers need accurate information about their city’s streets. Traditionally, road safety analysis has relied on historical data of actual crashes. However, the drawback of this “crash-based approach” is that it is reactive—we have to wait for crashes to occur in order to prevent them. And in developing countries, this data is often poor-quality and limited. Instead of analyzing past crashes, a more proactive approach is to analyze traffic conflicts. A traffic conflict is a scenario that could have resulted in a crash, but didn’t because the drive took some action—slowing down, changing direction or sounding the car horn. A key advantage of thinking about traffic conflicts rather than crashes is that they occur more frequently, making it possible to conduct studies in a much shorter time span. 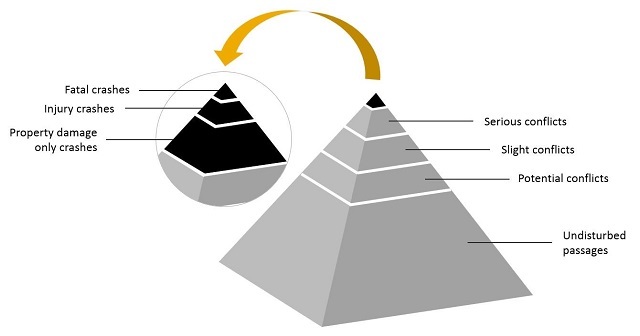 In a high-traffic situation, only several days are needed to collect enough data required for a conflict-based analysis, whereas a traditional crash-based approach would require a minimum of three to five years. Because of this flexibility, more cities should turn to conflict analysis as a way to measure and assess road safety. Because the process of a serious conflict is almost identical to that of a serious crash, analyzing traffic conflicts can provide insight into how crashes happen. When researchers only look at crashes, which are relatively infrequent compared to conflicts, they are only looking at the tip of the iceberg. Taking into account conflicts provides a much more holistic picture of the road safety situation. Although more studies are needed, the few conflict studies that exist have been able to predict crashes just as accurately as those that analyze historical crash data. These studies have been particularly accurate for situations involving pedestrians or resulting in injuries or fatalities. Early traffic conflict studies required a team of trained human observers who could physically recognize, assess and record the frequency and potential severity of traffic conflicts. However, this kind of manual observation can be both resource and time intensive, and can sometimes lead to variability in the data. 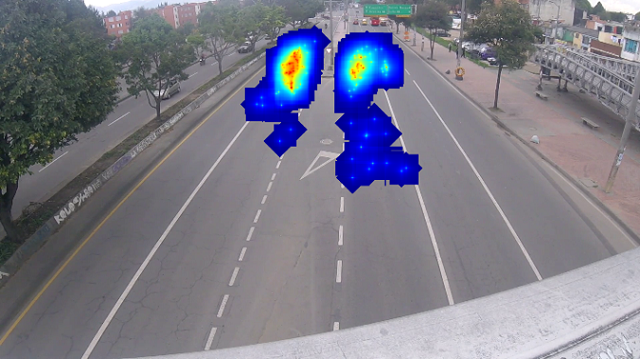 As a result, researchers have been increasingly moving towards automating the process of traffic conflict analysis, using low-cost sensors to create a video-based analysis. The sensors record information about traffic continuously and use sophisticated software to map all road users’ trajectories. 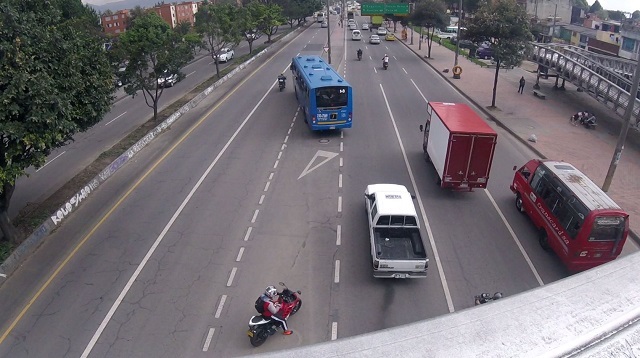 Furthermore, researchers can often simply use existing CCTV infrastructure and inexpensive consumer-grade video sensors to collect highly-detailed traffic data. It doesn’t have to be overly complex or expensive. 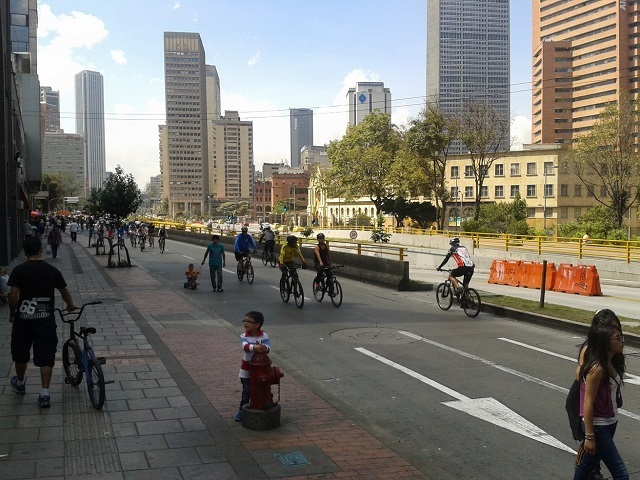 In partnership with Brisk Synergies, a team from WRI Ross Center of Sustainable Cities has conducted pilot studies using automated video-based conflict analyses in Bogota, Colombia. The selected site for the pilot study was an eastbound section of Calle 80, a popular arterial street which extends east-west through the city. A 40 meter-long gap in the street’s raised median allows drivers to change lanes and, despite road markings indicating one-way merging, it’s common for drivers to merge in both directions (left to right and right to left). From 2011 to 2015, six crashes have been recorded along this short segment, two of which resulted in severe injuries and four which only resulted in property damage. Conflicts of interest: Movement A involves a vehicle (or motorcycle) making lane change from right to left vs. through traffic vehicle (or motorcycle); and Movement B involves a vehicle (or motorcycle) making lane change from left to right vs. through-traffic vehicle (or motorcycle). The video data was collected with consumer-grade visible light cameras (GoPro HERO4 Session) with settings at HD resolution and 30 frames per second. 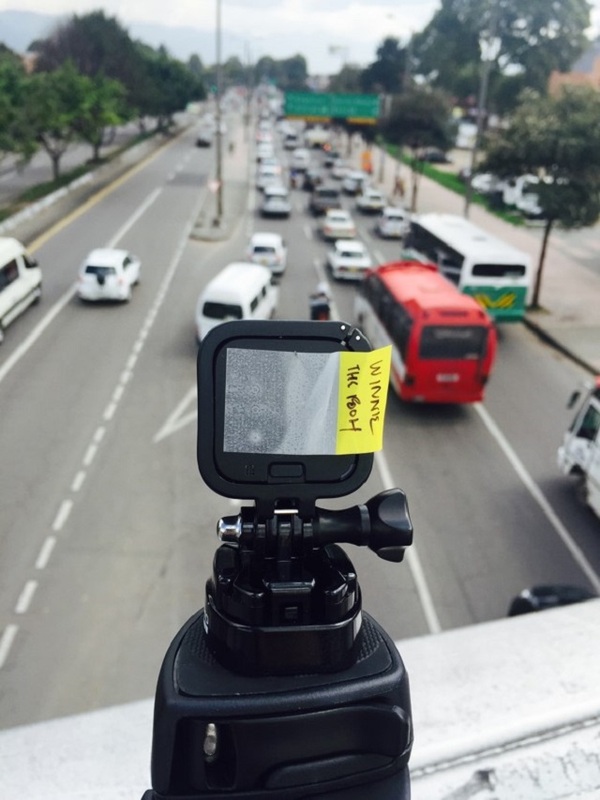 Over a two hour period, the camera was temporarily mounted on a pedestrian bridge. Temporary installation of camera. Photo by authors. Snippet of collected video data. Photo by authors. From this analysis, the research team created heat maps tracking where conflicts occurred. These maps showed that conflicts occurred very close to the median, suggesting that many motorists get stuck in the lane next to the median waiting for an opportunity to merge. 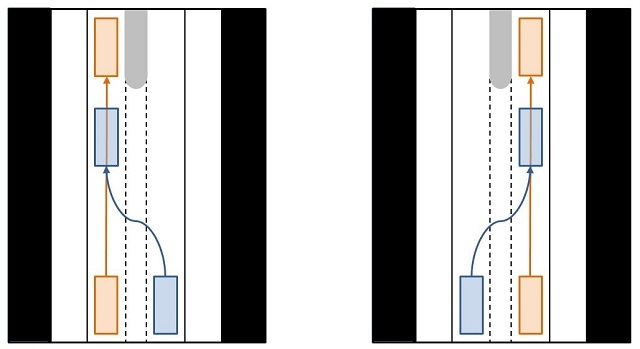 The short distance of this gap in the median and the high travel speeds indicates that closing the gap could help improve safety. Heatmaps of conflicts. Graphic by authors. Despite the many advantages of conflict analysis, many road safety analysts lack an understanding of the opportunity, limiting practitioners’ acceptance of non-crash based approaches. However, with the international development community’s widespread acceptance of Vision Zero to improve road safety, cities shouldn’t wait for crashes to happen in order to analyze and fix dangerous areas. Given these recent innovations in technology, cities should embrace a conflict analysis approach to better understand the urban environment and improve safety for all. This blog post was based on the following research: Chang, A., S. Zangenehpour, L. F. Miranda-Moreno, and C. Chung. 2016. Why wait for crashes to happen to prevent them? From reactive to proactive road safety analysis.